This recipe is an excellent low-calorie and high protein addition to breakfast or enjoyed as an appetizer for a party. Enjoy a few alongside some oatmeal with nut butter for a well-rounded breakfast or before a dinner with complex carbohydrates, fat, and some additional protein. Dysphagia Level 1 – Pureed – omit eggs, puree edamame filling adding extra olive oil if needed to make it very smooth. Serve as a topping on pureed protein. Dysphagia Level 2 – Ground/Mech Soft – omit eggs, make filling according to recipe and serve as a topping on a chopped meat or other protein. Dysphagia Level 3 – Soft – make recipe as is. Omit lemon zest garnish. Peel and halve the hard-boiled eggs. Remove the yolks and either discard them or save them for later use. Place edamame, garlic, salt, pepper, rice vinegar, and lemon juice in a food processor. Process until smooth. Stream in olive oil and continue processing until desired consistency is reached. 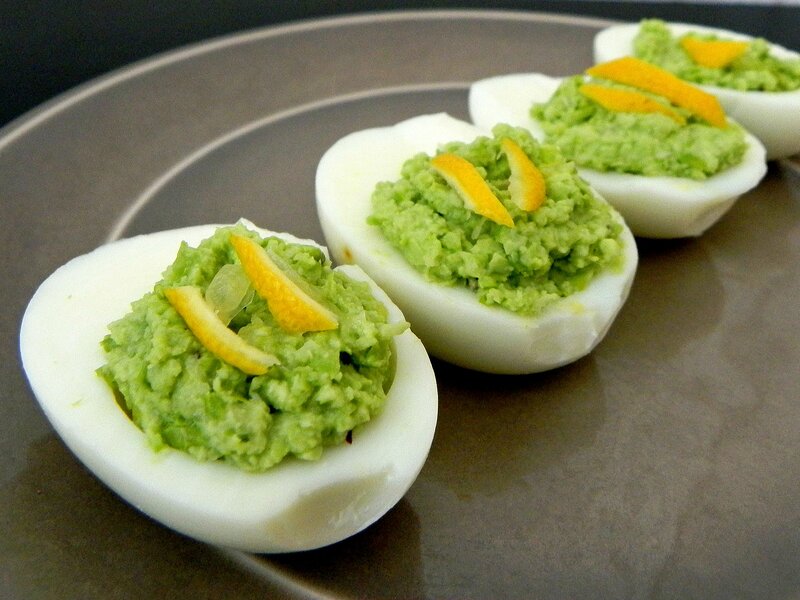 Fill each egg with 1 tablespoon of edamame mixture and top with lemon zest if desired.